PRISMs to Power the UK. : What a Forlorn Loser of a Billionaire! "... but if we mean to burn all the coal and any appreciable percentage of the tar sands, or even third-derivative, energy-intensive oil and gas, with 'fracking' for shale gas on the boundary, then we're cooked, we're done for"
and: ""the absolute minimum hope of survival is a gracefully declining population""
Talk about 'can't see the wood for the trees'. What an idiot! All of that personal wealth and control over £10s of billions and he's pratting about with AGW and 'saving the environment'. Why? 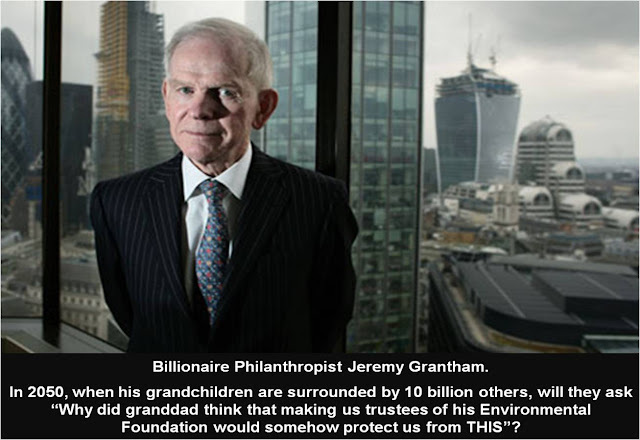 It's clean, safe and secure energy Mr Grantham. Nothing else will matter to a nation, when there are 10 billion of us, in just a few decades. The ¾ of the population, who currently use ¼ of the energy produced, will be fighting tooth and nail to reach our standard of living. We will be battling to hang on to our way of life. I hope, for his grandchildren’s sake, this is metaphoric fighting talk because by 2050 we will need 3 or 4 times more energy than we use now, in the face of declining and evermore expensive fossil fuels and other resources. One and only one technology has any chance of providing an energy-rich future to every individual on the planet, for all of time; it is that of the breeder reactor. The UK is uniquely placed at the moment, because we have an imminent decision, likely to go the way of such a reactor, for burning our plutonium stockpile. We could lead the world into the inevitable era of the breeder reactor. Get thinking clearly, Mr Grantham. Strive for peace and stability in a world where it is technically feasible for everyone to benefit from an energy source, free of greenhouse gas emissions and affordable by all. People like you can make a difference to the speed of introduction of breeder reactor technology and it needs to be happening now.